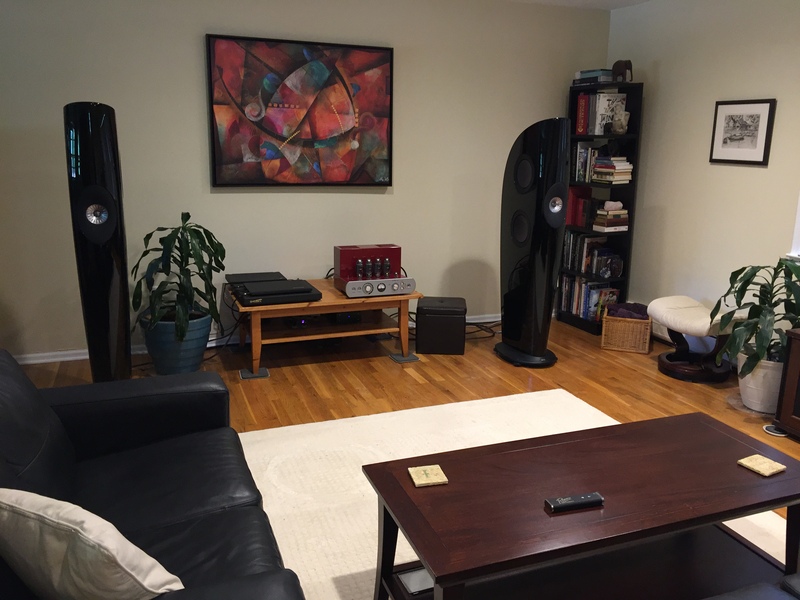 Rogers High Fidelity – you may demo by appointment in Parsippany, NJ or in Warwick, NY. Call (973) 428-9800, or contact us here, to arrange a demo. …also available for audition, the rest of the Rogers High Fidelity product line. The user experience is enhanced further with an iPad control app. A Bluetooth interface displays your amplifiers output levels using real time telemetry information, which is smartly displayed on the app. 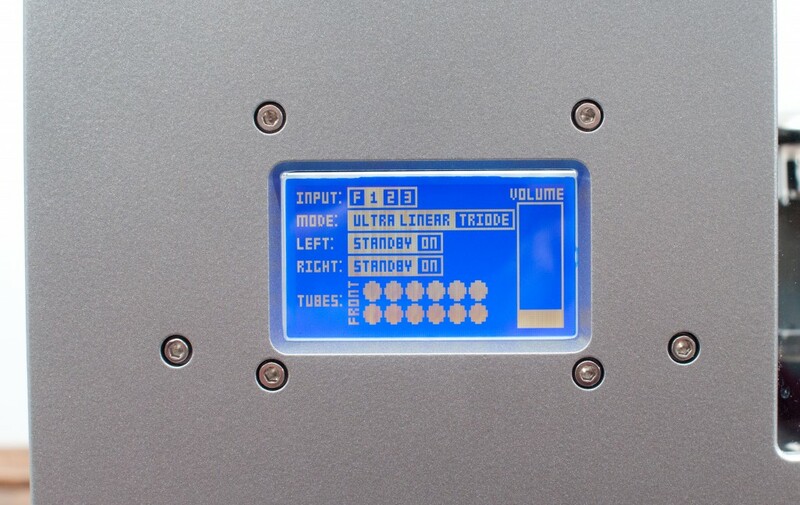 In addition, all features can also be controlled manually on the front panel. Rogers 65V-1 Integrated Amp rear view (above). 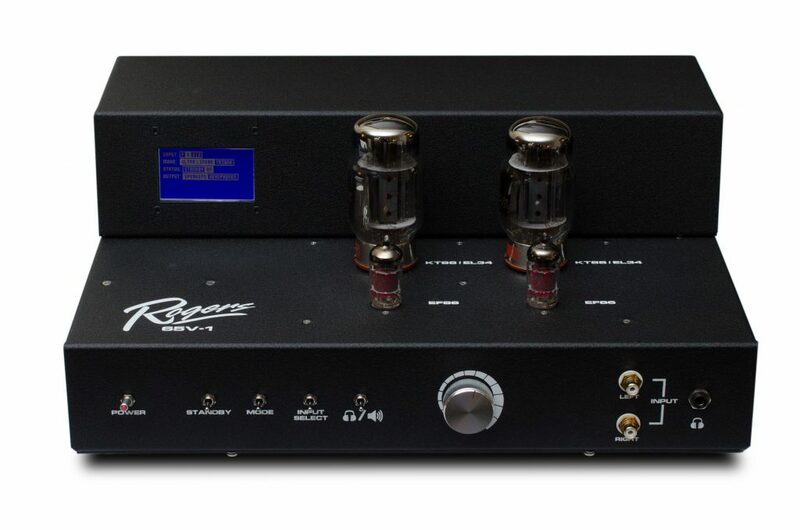 Rogers High Fidelity EHF-100 MK2 Integrated Amplifier. Optional tube cover available ($750). 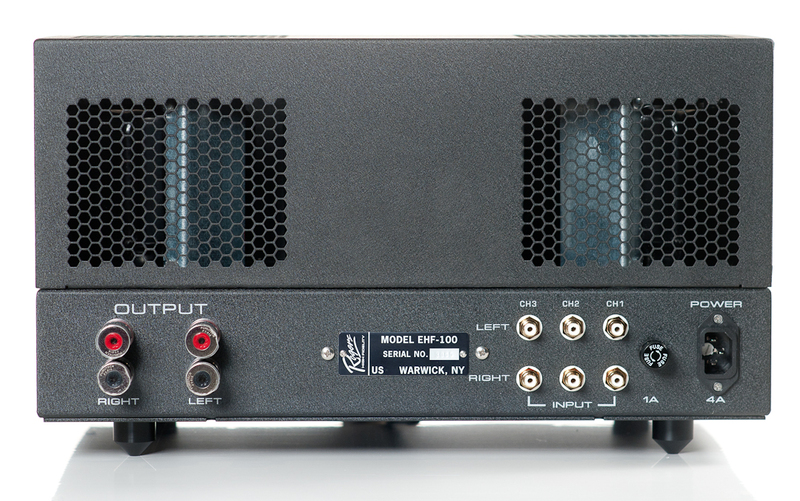 Scroll down to see the cover on the EHF-200 integrated amp. A preamplifier output for a powered sub-woofer. As standard, this output’s higher frequencies are filtered out. Full-range output available upon request. 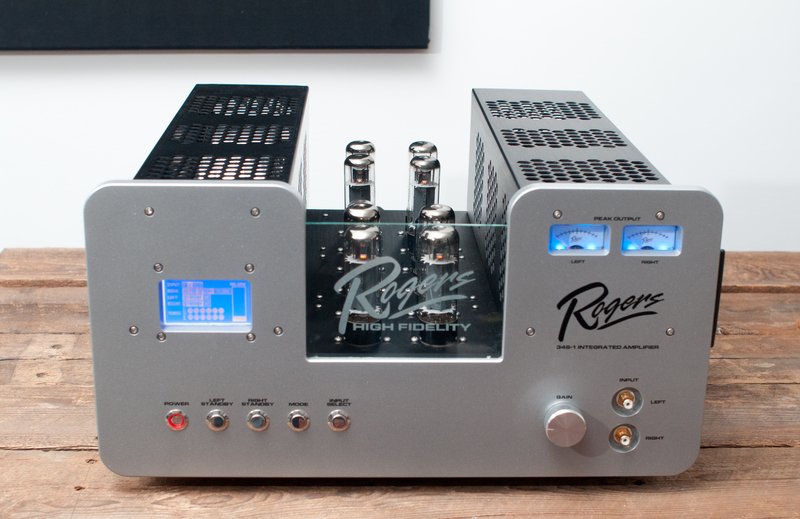 Rogers EHF-200 (above) shown with optional Tube Cover ($750). Come hear the EHF-200MKII paired with the KEF Blades. A beautiful amp/speaker combo if ever there was one! Powered by Eight EL-34 analog vacuum tubes, the 34S-1 integrated amplifier delivers monster performance and a dazzling listening experience. 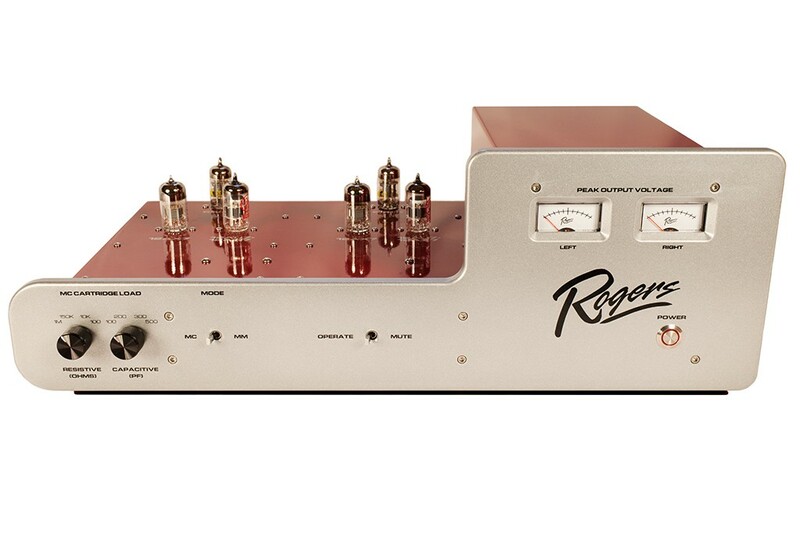 Consistent with Rogers High Fidelity’s gold-standard requirements, this Class A integrated Amplifier boasts superior precision, aerospace engineering and hand-made craftsmanship that presents a new level of realism in audio reproduction. 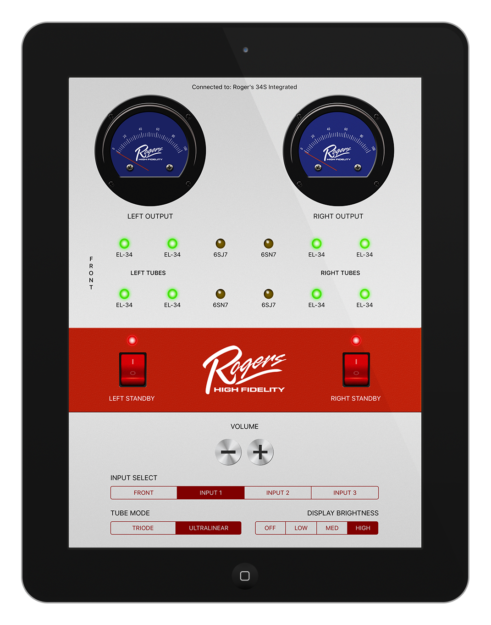 The ultimate control application, for the 34S-1 Integrated Amplifier, easily integrates Apple® iOS® devices with the Rogers High Fidelity Control System to monitor tube status and control all amplifier functions. Analog performance to ultimate perfection has always been the standard at Rogers High Fidelity. Our newest performer, the PA-1A Phono Preamplifier follows our heritage in every detail. You have not heard your record collection until you have heard it being played through the Rogers High Fidelity PA-1A Phono Preamplifier. It’s dual-mono, Class-A, all-tube design has an industry leading signal-to-noise ratio and represents an all out assault on the state-of-the-art. 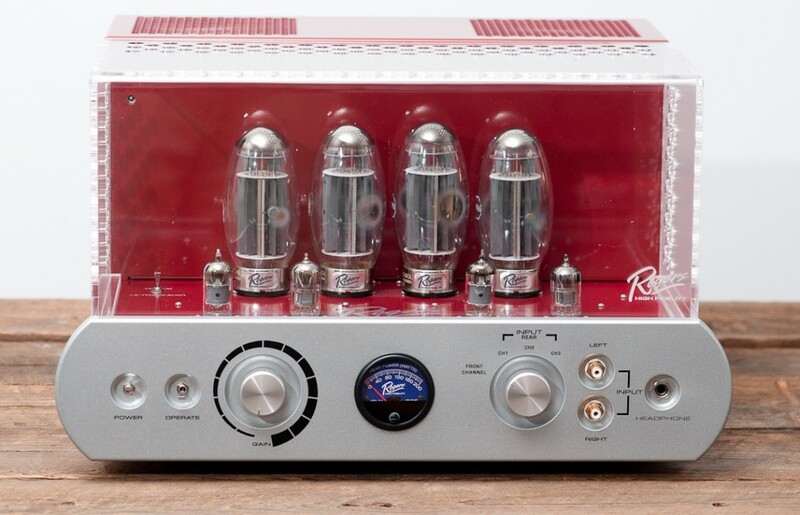 Unless you are listening to your vinyl collection through our high performance, vacuum-tube preamp, you are missing out on half of the tonal qualities that you love about analog reproduction. Made In The USA– Hand built to the most exacting specifications in our New York Facility. All amplifiers are fully evaluated and acceptance tested using the the best audio test equipment made by Audio Precision. We perform all of the tests in a typical Stereophile test evaluation and many more to characterize each amplifier. Each amplifier is shipped with a fully evaluated test data package so that the customer can see how his particular unit performed after acceptance. Transferable Lifetime Limited Warranty- Our Products are guaranteed FOR LIFE. 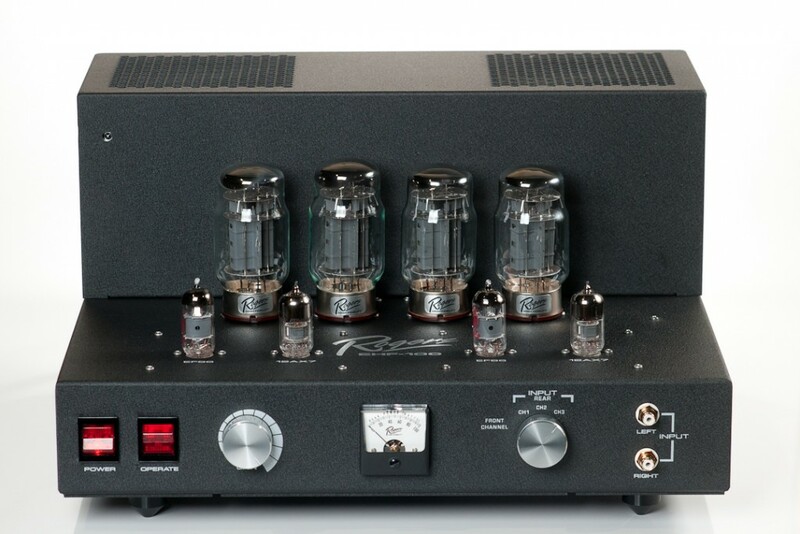 Completely Hand Wired– The entire amplifier is wired by hand using all American labor in NY. The wiring is all discrete components and all point to point. This provides a lifetime of serviceability and reliability. All of the wiring and soldering meets the Military Standard 2000 requirements. All operators are trained to this standard. Aerospace Specifications- All of our resistors, capacitors, transformers and inductive components meet or exceed the applicable military quality standards for parts selection. We use the same parts used by NASA in the Shuttle and Space Station equipment. Aviation Grade Chassis- All amplifier chassis are aviation grade aluminum with a mutiphase powdercoat and clear coat finish. The amplifier finish is absolutely beautiful and bulletproof! The front panels are machined from solid blocks of aviation grade aluminum. The entire amplifier is assembled using Military Standard stainless steel hardware for ultimate reliability and a lifetime of trouble free service. All hardware is meticulously staked using an aerospace coating to eliminate any hardware failures over time through vibration, shipping or movement. This is an assembly process honed over many years of satellite manufacturing and assembly where re-tightening hardware can’t happen. Internal Wiring– The entire amplifier is wired using 18 gauge Military Standard 16878 teflon coated, silverplated copper wire. This is the same wire used for the Navy’s Aegis Cruisers! Heat is the enemy of amplifier reliability. Because this is a Class A design, there is some heating of the unit which causes the wiring to age and degrade over time. Our wire never ages. The teflon coating will last a lifetime. 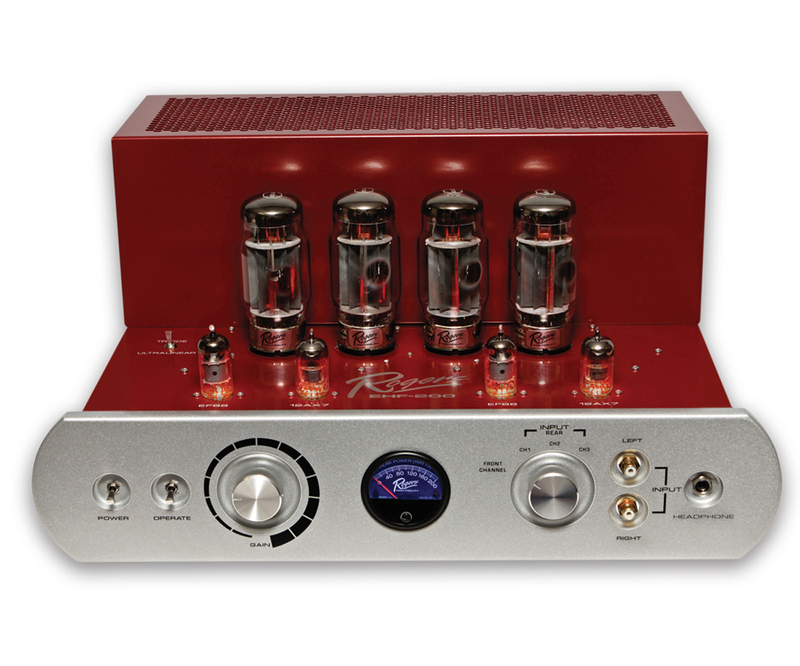 The interior of your amplifier will look the same in 10 years as it looks coming off of the production line. The amplifier is designed using all 18 gauge wire to provide many times more the current density than can be achieved using printed wire boards or lower quality wiring. 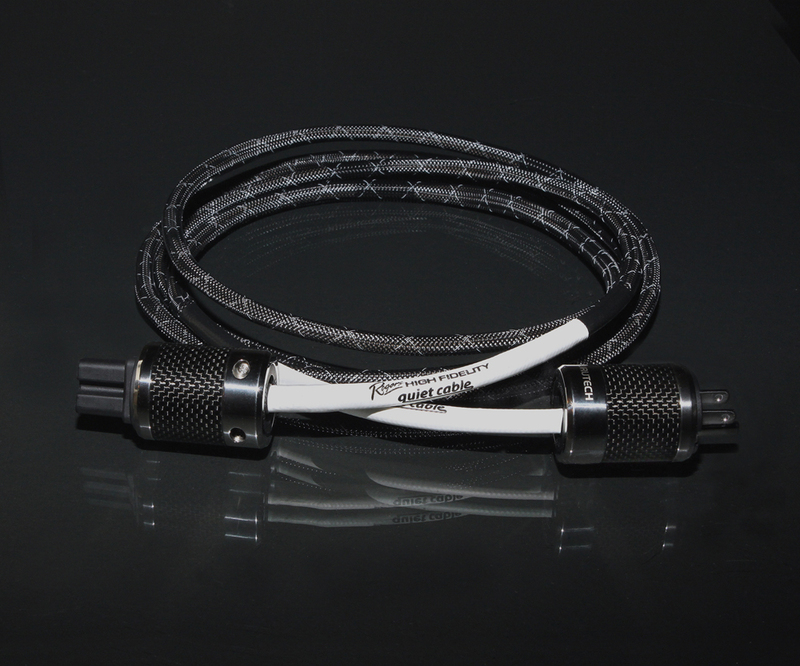 Binding Posts– We use Furutech binding posts for all amplifier designs. These are solid copper posts milled from OFC copper billets and then Rhodium plated with carbon fiber insulators. They are simply the best the industry has to offer. All inputs are gold plated RCA connectors. Power Measurement System– Each amplifier has a tuned, power measurement system that allows for flawless system integration and adjustment. Remote Control– The remote control provides 100% analog remote volume control. This feature eliminates any solid state components in the signal path which can compromise the analog, tube sound. Shipping– Each amplifier is shipped using a 2 box, double wall container system that has diecut, high density and low density foam vibration absorption material. This shipping system is designed to withstand a drop on all 6 box sides from 3 feet and produce no amplifier damage. We have NEVER had an amplifier returned for shipping damage. Your best value is when you let us help you design your whole entertainment system and then have us deliver and install it. Most systems, to get them right, require hours of preparation. A site survey is usually just a small part of this planning time. 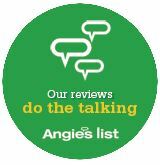 When you hire us to handle everything start to finish, you not only get it done right, you get all the hours of prep and planning at no charge. If you think checking out any of the above–or something else–might be useful then give a call to (973) 428- 9800 and let’s see if we can help. Please remember, all demonstrations at our Parsippany, NJ location are by appointment only.